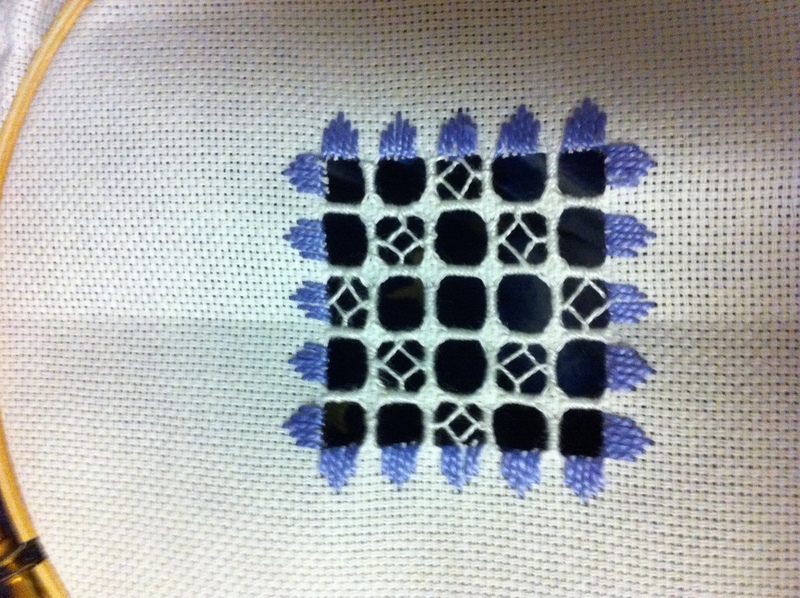 After finishing my first lesson in hardanger I was eager to get started on the second. I ran to the craft store and grabbed several different colors of the thicker (size 5 pearl) cotton thread and a ball of size 8 pearl cotton in both white and ecru along with a few more embroidery hoops. Now I’m prepared! 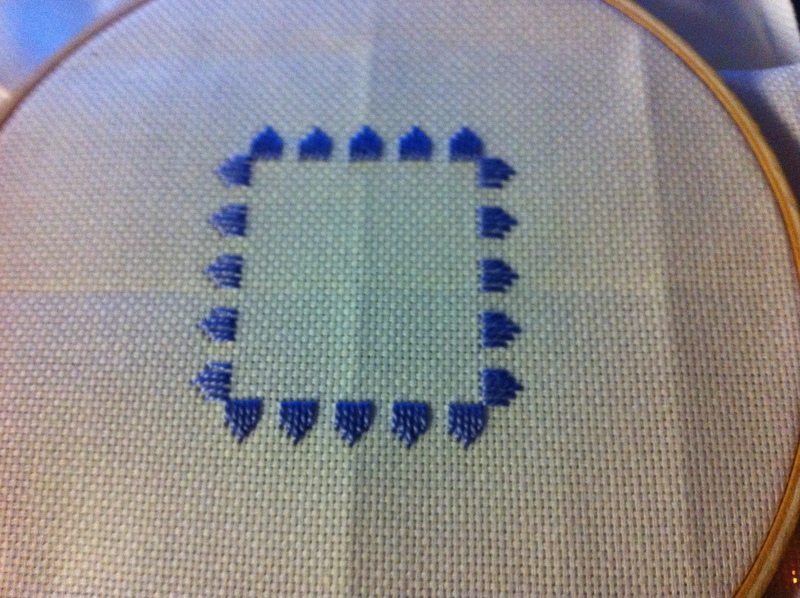 I started lesson 2 with a pretty purple thread and that went very fast. Next came the cutting which still scares me. It’s scary to think I might just ruin everything I just did and actually I did cut a little too close in a few spots and frayed the purple floss but it’s not noticeable unless you are looking for it. Those little scissors are really sharp! Now I have several groups of 4 threads that go vertically and horizontally across the open spaces. Now, I get to learn how to do “wrapped bars” and “doves eyes”. The wrapped bars are simple enough… you just wrap the thread around a group of 4 threads pulling them tight and making sure the thread lays flat and doesn’t overlap. The diagram for the lesson shows exactly where to start and you travel diagonally across the design. When you get to a spot where you need to add a “dove’s eye” you wrap the last bar (final bar to form a square) half way and then work 4 button hole stitches (going into the center of the other 3 wrapped bars) and finish back where you started going around the starting thread and and then you finish wrapping the bar. It really is a neat look when it’s all finished. 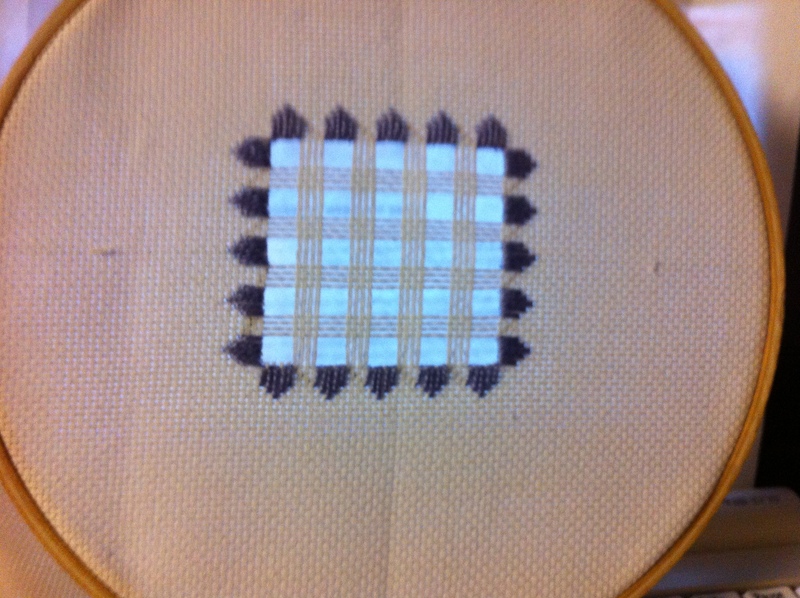 The “dove’s eye” stitch is really the same as the “square filet” from Lesson 1 only the “square filet” is worked into the corners of the open square and “dove’s eyes” are worked into the center of the bars. The was a really fun lesson! You are off to a wonderful start with your hardanger. Just remember to count twice and cut once and you should be OK. Have fun with it and don’t stress about it because the more relaxed you are the less likely you will make mistakes.